Atriplex prostrata, Denmark (Ordrup Næs in NW Zealand), youth mines; © Hans Henrik Bruun. Young larvae make a short, spiralled corridor (Bland ao, 2002a, describe them as “typically U-shaped”). This stage is followed by an irregular, sometimes branching, greenish-white blotch (Jansen, 1999a). In their finale stage the larva lives free in a silken tunnel among the leaves. 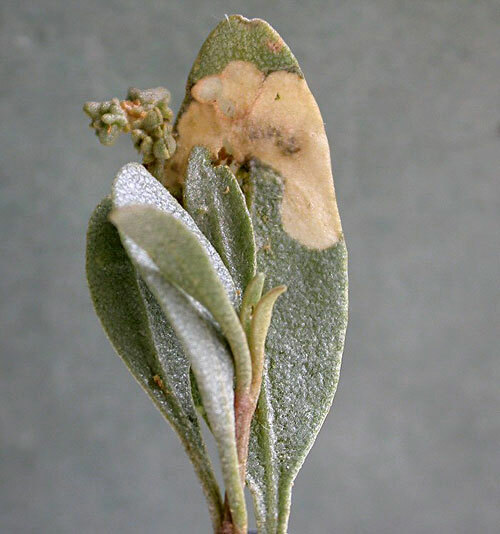 Atriplex calotheca, hortensis, littoralis, praecox, prostrata; Beta vulgaris subsp. maritima; Chenopodium album; Halimione pedunculata, portulacoides; Salicornia europaea; Suaeda altissima, maritima. Larvae are full-fed in mid-August – end-September; hibernation as pupa; one generation per year (Jansen, 1999a). From Fennoscandia to the Iberian Peninsula, Italy, and Bulgaria, and from Ireland to South Russia (Fauna Europaea, 2009). Described by Patočka & Turčáni (2005a); but see below. 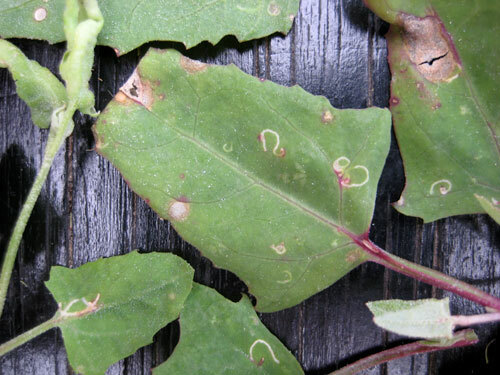 According to Patočka & Turčáni (2005a) the larve is not a miner, but “feeds on the seed heads of Chenopodium”. This can be a simple mistake, but may also indicate a different interpretation of the species. Bland ao (2002a), Gerstberger (2003a), Huemer & Karsholt (2010a), Huisman & Koster (1996a), Jansen (1999a, 2002a), Kaitila (1996a), Kasy (1965a), Kuchlein & de Vos (1999a), Patočka & Turčáni (2005a), Schütze (1931a), Wegner (2010a, 2o13q).